Princess Orihime weaved night and day, so much so that her father, the emperor of the galaxy, arranged for his workaholic daughter to meet Hikoboshi (also known as Kengyu), a handsome cowherd. It was love at first sight, and the couple married immediately. Busy being a devoted wife, Princess Orihime soon neglected her weaving. This angered her father; first she was weaving too much, then she wasn’t weaving enough. So, the emperor separated the young lovers, sending Hikoboshi to the other side of the Amanogawa, or the Milky Way. Beside herself with loneliness, Princess Orihime cried and cried. Her tears began the rainy season. Her father couldn’t stand to see his daughter in this state, so he allowed her to visit her beloved one day a year, on the seventh day of the seventh month. This story, which originated from Chinese folklore, is the basis of Tanabata (literally “night of the seventh”), or the Star Festival. To honor Orihime and Hikoboshi, the Japanese write their wishes on thin strips of paper called tanzaku and hang them from bamboo branches. They wait for July 7 so that their dreams will come true. Opening reception Saturday, July 7 from 6:00 p.m. until 8:00 p.m.
New York based awarded winning Japanese painter, sculptor, and poet Minako Yoshino presents a multimedia exhibition, including her masterpiece Water Spirit, a 16 ft long painting of the star river. The exhibition features images of Yoshino at work, taken by Parsons instructor of photography Tony Gale and expertly printed on Brilliant Museum paper by event sponsor Loupe Digital. Yoshino will share the forgotten and charming story of Tanabata at the opening reception, which features live music by special guest pianist Makia Matsumura. Yoshino will also exhibit her sculptural painting on delicate hand fans, previously shown at the Tokyo Metropolitan Museum of Art, for the first time in NYC. Yoshino’s works are in the permanent collection of the Japanese Red Cross Society, and have been nominated by the United Nations for a future exhibition. Ends Monday, July 9 from 9:30 a.m. until 4:00 p.m. Since mid-June the Consulate General of Japan in New York has had a Tanabata display at their Japan Information Center. 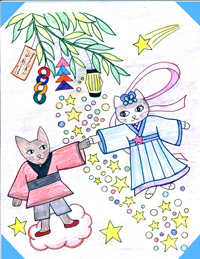 Write your own wish on tanzaku and learn more about Tanabata through coloring. Sunday, July 15 at 2:00 p.m.
At this annual family program, Japan Society introduces the legend of Tanabata to children through the Japanese storytelling tradition of Kamishibai. Children will learn how to make tanzaku and add their wishes to bamboo branches. Space is limited, so advanced ticket purchase is strongly recommended.